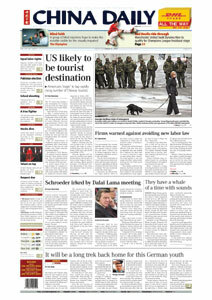 The formation of the largest city group in West China, the blurring of distinctions between the city and the countryside, and the emergence of new industrial bases - these will be the direct outcome of the implementation of a new economic strategy in Chongqing, the newest municipality in China. 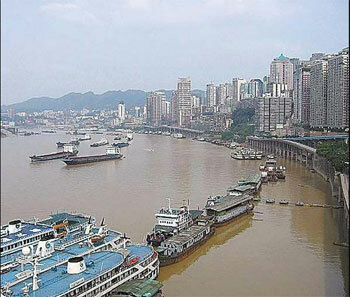 The Yangtze River in Chongqing is a busy transportation channel linking the municipality and the rest of the country. "Chongqing will spend 15 years to forge a one-hour economic circle, developing into the largest city group in West China," announced Wang Yang, secretary of the Chongqing Committee of the Communist Party of China, at a recent work conference. The one-hour economic circle, an area where people can get to the central city by any means of modern transport, is composed of 23 districts and counties. 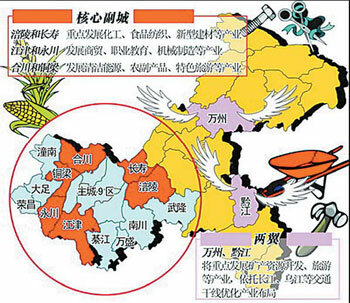 These include nine districts in the central city, as well as the districts and counties of Changshou, Hechuan, Fuling, Yongchuan, Jiangjin, Wansheng, Bishan, Qijiang, Rongchang, Nanchuan, Dazu, Tongnan, Tongliang and Wulong. Urban population is expected to grow by about 10 million within the next 10 to 15 years in the area, which is projected to contribute more than 80 percent of the municipality's total gross domestic product (GDP). The one-hour economic circle is one part of the strategy. Another important part is the development of the "two wings"-the northeastern and southeastern regions -which are relatively less-developed areas of the municipality. The two schemes are complementary to each other because one of the most important targets of the strategy is ensuring that the development of the one-hour economic circle makes good use of the natural and labor resources of the regions under the "twowings" and the one-hour circle area bears the responsibility of helping the two-wing regions in poverty relief. Under the coordination of the municipal government, the one-hour circle should absorb more labor forces from the two-wing regions by creating more job opportunities. As more residents are relocated to the developed areas of Chongqing, the two-wing regions will be relieved of the burden of farmland shortage and limited job opportunities. In the one-hour economic circle area, about 100 towns will be expanded or built up newly to receive immigrants from the northeastern and southeastern regions. These towns will be located along the highways, railways and navigable rivers. Some districts and counties in the one-hour economic circle have already begun to absorb laborers and immigrants from the two-wing regions. For example, Beibei District in the central city has recently launched the Wushan Industrial Park to receive laborers from the northeastern region. The development of the one-hour economic circle means huge business opportunities because a number of new industrial zones and parks are planned in the area, according to Wang Qing, head of the Chongqing Development and Reform Commission's development planning department. He said a central industrial zone will be formed in the central city, focusing on the modern service industry and other high value-added industries. The northern industrial zone will be built in the north of the central city, with an emphasis on such industries as automobiles, electronics and bio-pharmaceuticals. The eastern industrial zone, with the Chayuan New District as the center, will focus on the development of equipment manufacturing, and the convention and exhibition industries. The southern industrial zone, with Yudong as the center, will be a base for the production of motorcycles and spare parts. Finally, the western industrial zone in the Xiyong and Xipeng areas will be a hi-tech industrial base mainly engaged in software development and outsourcing, and the production of chips and instruments. In addition, four other industrial belts will be built along the Chongqing-Wuhan, Chongqing-Chengdu, Chongqing-Suining and Chongqing-Hunan railways. With the construction of the industrial zones, six industrial clusters will be formed in Chongqing, featuring automobile and motorcycle production, natural gas and petrochemicals, equipment manufacturing, new materials, and the high technology and food industries. Wang Qing predicts that about 1 trillion yuan will be invested in the one-hour economic circle between now and the year 2010.